Do robots dream of electric leave? Are the robot-workers really coming, or will HR choose autonomy over automatic? A new coffee-making “robot” has been unveiled at The University of Texas. The machine, owned by Briggo, is designed to simulate the motions of a barista to create café-quality coffee, BusinessWeek reported. Kevin Natter, CEO of Briggo, stated he believes the Briggo Coffee Haus will sweep the nation. Baristas are not the first to be threatened by the rise of automated machines. Manufacturing has been heavily targeted as an area likely to see a drop in roles for people, although truck drivers are also in the firing line, as driverless cars such as Google’s begin to rise. Even journalism is being seen as an area that may be threatened by software that can write articles, such as sports news. This is achieved by inputting the necessary information (the scores, teams, etc. ), and then the software builds a short article relaying this information. BusinessWeek stated that once sports journalism is conquered, financial, medical and survey data may be next. Despite this, the rise of robotic workers may not eliminate human jobs, but act as additional tools. HRM previously reported on the HR robots La Trobe University, which were described by Professor Rajiv Khosla as additions to the workplace, both in providing a tool for recruitment as well as being used to engage and entertain employers. “What we are trying to do here is improve the quality of engagement for employers and employees,” he said. 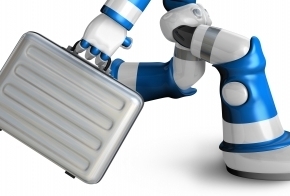 Could robots be taking over jobs? We at HRM aren’t too worried, but what do you think?